September 23rd-September 29th Weekly Giveaway! Swaddlebees ABC Wraps $15.95 SALE $11.95 Item of the Week runs Wednesday through the following Wednesday! Wednesday is DOUBLE DEAL DAY with overlapping Items of the Week! The Snappi Diaper Fastener is a SAFE, HYGIENIC, and EASY to use fastener that offers a practical and reliable way to fasten a cloth diaper, replacing the diaper pin. It comes in a variety of colors and is made from a stretchable non-toxic material, which is T-shaped with grips on each end. These grips hook into the cloth diaper fabric to ensure a snug-fitting diaper with enough natural movement for the baby. 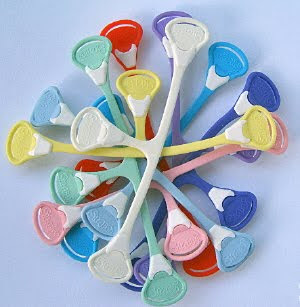 You will need one Snappi Diaper Fastener at a time to diaper your baby. The Snappi Diaper Fastener also offers a safety feature - when the fastener is not in use just fold the thin strip at the end of each leg to the back of the Snappi and slip over the teeth of the white grip. This acts as a barrier and prevents the sharp teeth from being exposed - GENIUS! To enter to win a Snappi Diaper Fastener, leave a comment on our blog with a link to each qualifying entry. You may only do each entry option once per weekly giveaway unless otherwise stated. "Commenting for the giveaway" or similar spam comments on our FB or Blog page do not qualify as an entry and will not be counted. There will be FIVE winners chosen this week. Winner will be posted October 7th. Winner must email annie@nickisdiapers within one week to claim your prize or it will be re-drawn. Tell us what your favorite flat or prefold fold is. Place an order at nickisdiapers.com, myswimbaby.com or clothdiaperclearance.com between September 30th and October 6th. Include your order number in your entry. September 23rd-September 29th Weekly Giveaway WINNER!! Congratulations to Sarah DJ! You are the winner of a Best Bottom Moo-licious snap shell and 3 Best Bottom Stay-Dry Inserts in your choice of size! Please email annie@nickisdiapers.com within one week to claim your prize! One of the most frequently asked questions we get from our customers has to do with some sort of smell issue. It isn't normal for cloth diapers to smell so we want to help you solve your problems and never have them again! There are two types of stink issues: 1. "Burn your nose ammonia stink!" When you diapers comes out of the wash, they seem clean. 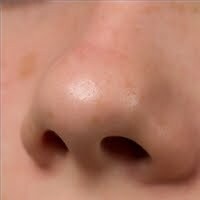 The minute your child pees in them (you'll often notice the smell when you go to change their diaper), your nose burns from the smell. This is often accompanied by a red bottom and possible leaking or repelling of the diapers. Culprit: Detergent build-up Solution: Deep cleaning- To deep clean your diapers, start with clean cloth diapers. Fill your washer up to the highest water setting with hot water and let your diapers soak for several hours (or even overnight), agitating them occasionally. Drain your washer and run several hot washes without detergent to remove any build-up. 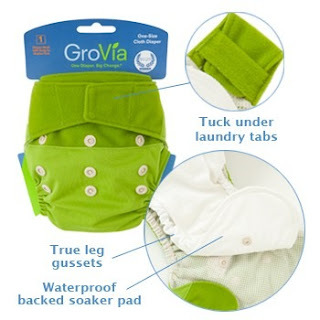 Prevention: Cloth diapers should be washed with a clean rinsing detergent, like Country Save, Bum Genius Cloth Diaper Detergent or Tiny Bubbles, to prevent build-up. These detergents can be used in a top loading or HE washing machine. 2. "Barnyard" or "Fishy" smell. 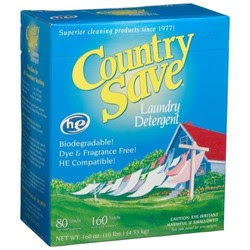 You will often smell this when you diapers come out of the dryer or off the of line. They just don't smell clean even though they appear clean. Culprit: Cloth Diapers not getting clean enough Solution: Add more detergent and water- It probably goes against everything you know about washing cloth diapers, but you likely need to add more detergent. Cloth diapers need detergent to get clean! Perhaps you are running larger loads for the amount of detergent that you're using or your diapers are not getting enough agitation in the amount of water they are in. Prevention: It may take some trial and error to find the correct amount of detergent that you need for your diapers. If you are using a clean rinsing detergent (County Save, Bum Genius Cloth Diaper Detergent and Tiny Bubbles are all clean rinsing formulas) then you are much less likely to get detergent build-up when you are experimenting. Always set your water level to the highest setting so insure proper agitation of the diapers (add a soaking wet towel to your HE machine to "trick" it into adding more water). All sized Hotslings on sale! Originally $60, now $35! Originally $50, now $30! Item of the Week runs Wednesday through the following Wednesday. Wednesday is DOUBLE DEAL DAY with overlapping Items of the Week! In honor of the release of the Moo-licious Best Bottom One-Size Cloth Diapering System print, we're going to give 1 Moo-licious one-size snap shell and 3 stay-dry inserts (in choice of size) to 1 lucky winner this week! Please read below carefully, we've changed some things! 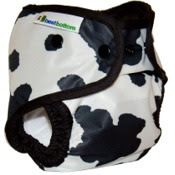 To enter to win a Moo-licious Best Bottom One-Size snap shell and 3 stay-dry inserts (in choice of size), leave a comment on our blog with a link to each qualifying entry. You may only do each entry option once per weekly giveaway unless otherwise stated. "Commenting for the giveaway" or similar spam comments on our FB or Blog page do not qualify as an entry and will not be counted. Winner will be posted September 30th. Winner must email annie@nickisdiapers within one week to claim your prize or it will be re-drawn. Tell us what your dream Best Bottom print is and name it! September 9th-September 15th Weekly Giveaway WINNER! Congratulations to Mama Bee! You are the winner of a Vanilla GroVia One-Size Shell and Soaker Set! Please email annie@nickisdiapers.com within one week to claim your prize! I know what you're thinking. "I just finally figured out all there is to know about cloth diapers, now you're telling me I have to learn about cloth WIPES too?" Just like with diapers, there are different styles and routines that work better for each family. The key is finding what works for YOU. Why cloth wipes? Environmentally, for the same reasons as you use cloth diapers. Less waste, less chemicals. Good stuff. Cost-wise, you end up saving a lot by re-using wipes instead of throwing them away. Ease of use? If you're cloth diapering anyway, why throw away wipes when everything else gets tossed in a wet bag? For cloth diapering families, many times cloth wipes just make sense. What options are out there? Cloth wipes can be everything from pieces of fleece or cotton terry to wipes made from bamboo or hemp. Lots of kinds out there. I surveyed some moms I know, and many preferred thinner, more pliable wipes of the cotton or flannel variety. Apparently this is especially important with girls for hygiene -- something I wouldn't immediately consider! Flannel baby wipes are what I use in my house, and I've been pleased with the durability. What should I consider when choosing a wipe? Do you want absorbency? Softness? Durability? Cute colors? Do you want thick, hearty wipes or something more pliable? How many do you need? I find that I typically need LESS wipes per diaper change with cloth, as they seem to clean more thoroughly. How do I use them? This gets a little tricky to answer. Just like every family has their own diaper system, each family has a slightly different method of preparing and storing wipes. Personally, I keep them in a bin (dry) until I need them. I spray as many as I need with wipe solution (more on that later) and pop dirty wipes into the wet bag with the diapers. I carry a spray bottle of solution and dry wipes in my diaper bag on trips. Some families moisten the needed wipes all together in a container for the day's use. 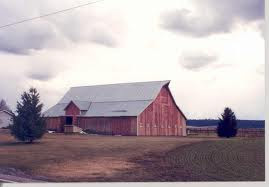 Some combine the methods and pre-moisten for leaving the home. All are correct methods if they work for you! Wipe solution? Nicki's Diapers offers several wipe solutions. I personally use the LuSa Organics Baby Wipe Juice. I mix it up in a spray bottle (the peri bottles from the hospital are PERFECT for this) and store the bottle with my wipes. Easy! If you're into the DIY scene, here's a recipe to make your own wipe solution, too! Here's an awesome video for instructions on folding cloth wipes for that "pop-up" disposable effect -- so great if you're storing your wipes in an old disposable wipes box! If disposable wipes are still your thing, Nicki's has you covered there, too -- we offer a couple varieties of disposable wipes (that are a little more on the natural side!) as well. Don't forget a wipe pouch or small wet bag to keep your wipes moist and organized! Still have questions? Leave a comment on this post! Tell us about your favorite cloth wipes and your system! The GroVia One-Size Diaper System has a one size diaper that is different! This diaper system has 2 parts. First the shell - the design of the shell is waterproof and minimizes diaper waste and cost because it is reusable! Second is the soaker - when the organic cotton Soaker Pad is wet, simply remove it and snap in a fresh Soaker Pad. If the shell is wet, allow it to air dry and use for the next diaper change. If the GroVia Shell is soiled, start fresh with a new GroVia Shell. Each shell set comes with 1 organic Soaker Pad. 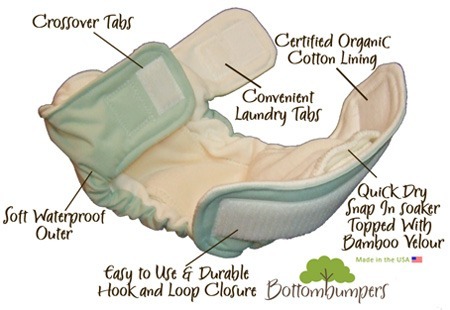 Extra one-size organic cotton Soaker Pads are available in packs of 2. One-size organic cotton Boosters are also available in packs of 2. You will find that using 2-4 Gro Baby Shells are enough per day, but newborn babies may need more. The GroVia Organic Cotton Soaker Pads are super absorbent but trim. With a layer of waterproof backing, leg gussets and 6 layers of organic cotton they won't leak for even a heavy wetter! 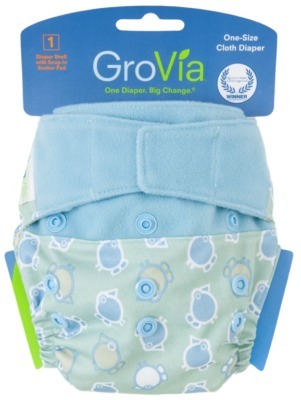 Each shell includes 1 GroVia Organic Cotton Soaker Pad. Also available in 2 packs. To enter to win a Vanilla Grovia Shell and Soaker Set, sponsored by the manufacturer , leave a comment on our blog with a link to each entry (examples: your blog post, your comment on our FB page, etc.). You may only do each entry option once per weekly giveaway. Winner will be posted 9/16. Winner must email annie@nickisdiapers.com within one week to claim your prize. Wednesday is DOUBLE DEAL DAY with overlapping Item of the Week! Congratulations to The Moms To Be! You've won an Indigo Moby Wrap! Please email annie@nickisdiapers.com within one week to claim your prize!